A trial involving over 1,500 GP practices in England has found that writing to GPs about their antibiotic prescribing habits has resulted in 73,000 fewer prescriptions (a 3.3% reduction) over 6 months. This has saved over £92,000 in prescription costs for the NHS. 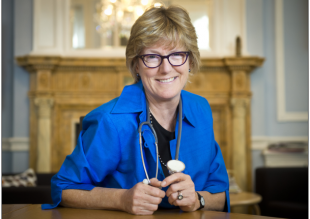 The letter, penned by Chief Medical Officer Professor Dame Sally Davies, advised GPs how their practice compared to others in their area and used this simple tactic to encourage behaviour change. This is all part of the government’s plans to slow the growth of antimicrobial resistance, which is essential if we are to preserve our precious drugs. The trial was a collaboration between the Chief Medical Officer, Public Health England and the Behavioural Insights Team, and is now being rolled out nationwide after its initial success. There were two groups involved in the trial, GPs and patients. GPs were sent a letter saying ‘80% of practices in your local area prescribe fewer antibiotics per head than yours’, and were provided with three ways to make sure any antibiotics prescriptions were necessary. Meanwhile, patients were targeted with leaflets and posters about why reducing the use of antibiotics is important. You can read more about the trial in The Lancet article, Provision of social norm feedback to high prescribers of antibiotics in general practice: a pragmatic national randomised controlled trial.